While Food for Special Dietary Use might sound complicated, it’s simply a way to categorize foods that aren’t conventional or medical foods or dietary supplements. Considering we live in a day and age when food packaging and products can be quite confusing (to say the least), it is important to understand the differences. According to the FDA (Federal Drug Administration), foods and food products are broken down into the following categories, whose differences include the development of a product, labeling, marketing, and use, among other considerations. This is the simplest category to understand, as it is regular food and beverages that you eat in normal portions. Common examples that are eaten every day include bread, pasta, soups, cereal, etc. Any nutrition claims on the packaging must meet certain requirements. To consume medical foods, you must be under direct medical supervision. These specifically formulated foods and liquids are meant for dietary management of a diagnosed condition. These products can make health claims that other, foods cannot. Dietary supplements, like the other three categories, are put into the food category but and regulated under the Food, Drug and Cosmetic Act. Supplements contain an ingredient or multiple ingredients that are meant to supplement the diet with a mineral, vitamin, amino acid, herb or another type of nutrient or botanical. Unlike actual foods, supplements usually come in the form of capsules, tablets, liquids or powders. Foods for special dietary use fall somewhere amongst the categories mentioned above. They are not used under medical supervision, nor can they make health claims (as can medical foods). To understand this category of foods a little bit better, you can think of them as food used to address dietary needs that you might have due to a physical or physiological condition, or other. These conditions could be due to illness, pregnancy, and lactation, being under or overweight or being sensitive or allergic to foods. Foods for Special Dietary Use can be beneficial because (unlike medical foods) they are widely available. They also may have fewer side effects than pharmaceuticals, and your body digests them similarly to the way it digests conventional food. You don’t need any sort of medical supervision to purchase and consume them. Most importantly, food for special dietary use is food. Therefore, you can feel more comfortable consuming it and giving it to your family. This type of food has shown promise in recent years. We’re excited to support consumer’s health in a new way. 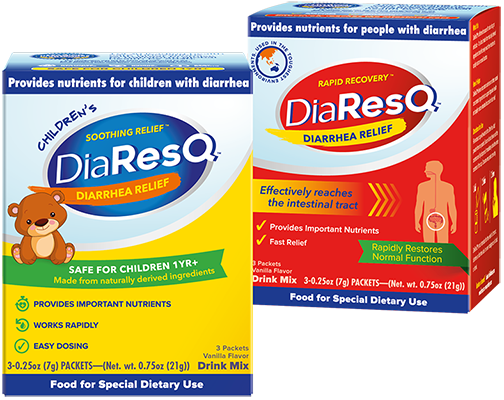 DiaResQ is a food for special dietary use that quickly provides relief of occasional diarrhea. Because it’s a food, it effectively reaches the digestive tract and promotes healthy digestive function. Learn more about DiaResQ for you and your family here.